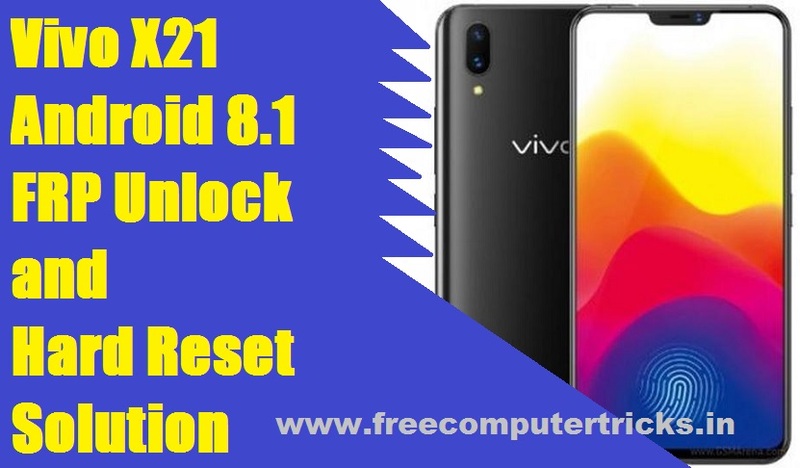 Here is another interesting tutorial about, how to reset frp lock of VIVO X21 Android 8.1 Smartphone. In this topic we will discuss all the possible ways to unlock, bypass or reset FRP (Factory Reset Protection) of Vivo X21 phone. The phone has Qualcomm chipset and you must follow the Qualcomm FRP Unlock process to reset frp. Let's have a look at the Technical features of the Vivo X21 Phone, the phone has Qualcomm SDM660 Snapdragon Chipset and Octa-core CPU with Adreno 512 GPU. The Android 8.1 (Oreo) smartphone has Funtouch OS 4.0 with full view display size of 6.28 inches and with a resolution of 1080 x 2280 pixels. The phone's built in storage is 64/128 GB with 6 GB RAM, you can expand the external storage up to 256 GB using microSD card by using the SIM 2 slot. If look at the camera feature of the phone, the phone has Dual 12 MP primary camera with 12 MP secondary camera with a video resolution of 1080 pixel @ 30fps and the phone released in India on March 2018. Now let's know how to do Vivo X21 FRP Reset, Vivo x21 hard reset, Vivo X21 FRP Bypass, Vivo X21 FRP Unlock and solve Vivo X21 forgot password and Gmail Id. How to Hard Reset Vivo X21? Hold Volume Up and Press Power Key. Now Choose Recovery Mode and Power Key to Enter. Then select Wipe Data and press power key to perform the action. Then click on Power Down, it will switch off the phone. Now switch on the phone manually and set up the new phone. How To Bypass FRP VIVO X21? To unlock or bypass frp lock on the Vivo X21 Android 8.1 smartphone you can use the following methods.